← This One is Going to Test You…. 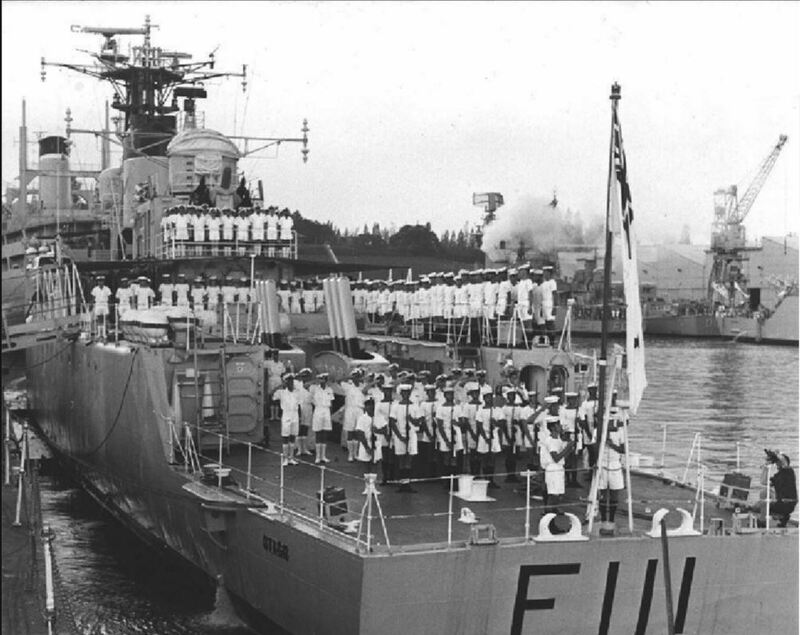 An image of HMNZS OTAGO in Singapore in 1968 when we changed from the Royal Navy White Ensign to the New Zealand White Ensign. ASG HOF French and OSG Frank Rands at the Ensign Staff. Chief Yeoman was Alec McKenzie and Petty Officer Yeoman was Charlie Cameron, Leading Hands were Jake Huka and Frank Saunders, Able Rates were Stu Keith and HOF French. OSG’s were Rands, Cleaver, Help who else was there? Posted onto Otago 30 Jan 1968 until 5 March 1970 so guess I was there – think shortly after this we went to Bangkok in company with RN and RAN where a Russian Warship was leaving and Otago was the only one they acknowledged due (to rumour) we had red stars on our flag – Was Bruce Kenyon also a signalman? The next one will be interesting if King John has his way. Surely it will end up with only half a white feather, sorry fern, when the white background is in place? the way things are going there isn’t going to be a change..what then??? The referendum results are legally binding. Assuming no intellectual property issues, the Flags, Emblems and Names Protection Act 1981 would be updated to reflect the new design. This result would not change the coat of arms, national Māori flag, the flags of Associated States (Cook Islands and Niue), nor the New Zealand Red Ensign (merchant marine), White Ensign (naval), police flag or fire service flag which are based on the current flag.